This news is out of the blue, and something that not many would expect. For the first time ever Indian Smartphone market has contracted (quarter on quarter basis), if the IDC report is to be believed. The report says that Indian smartphone market declined by 4 percent, while the feature phone market plummeted by approximately 14% over Q3 2014. The overall mobile phone market stood at 64.3 million units in Q4 2014, which reflects a sequential drop of 11% over Q3 2014 and an annual drop of 5%. Even though, these numbers are quite unbelievable, IDC is one of the most leading research firms in the world, and numbers published by them are regarded as most credible. If this is true, then it should be a cause of worry to smartphone manufacturers because every other market indicator points to the fact that smartphones are growing at a healthy pace. IDC points that this was largely owing to the fact that previous quarter had festive season, where the shipments witnessed sharp surge. The report also points that even though Smartphone shipments have fallen on quarterly basis, the general growth remains quite healthy. 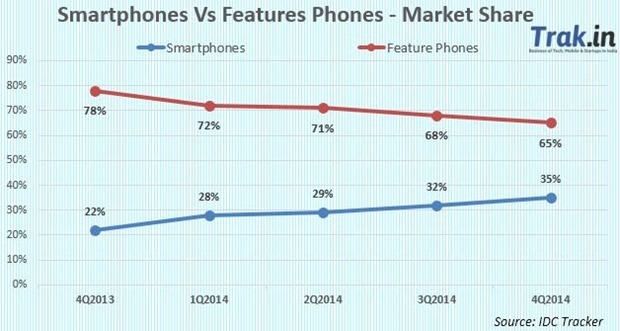 Feature phones are now fast going out of favour – in last one year their market share has fallen from 78% to 65% whereas Smartphone market share has increased from 22% to 35%. According to Karan Thakkar, Senior Market Analyst at IDC India, “Smart Phone vendors are quick in gauging the consumer demand for 4G handsets. In percentage terms, 4G handsets are still in single digit. 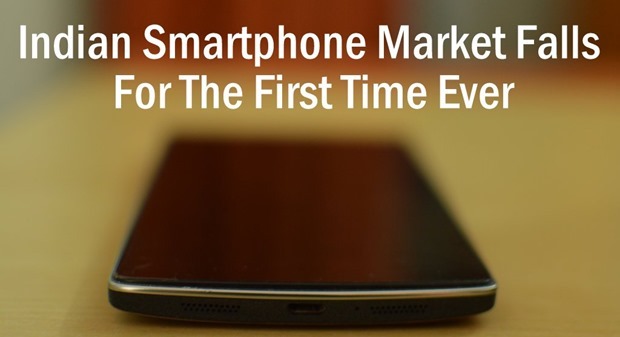 But vendors who are not yet ready with the 4G portfolio are likely to miss the next wave of Smart Phone growth story. This is very interesting – just couple of weeks back Canalys report revealed that Micromax had overtaken Samsung and had sold more smartphones. 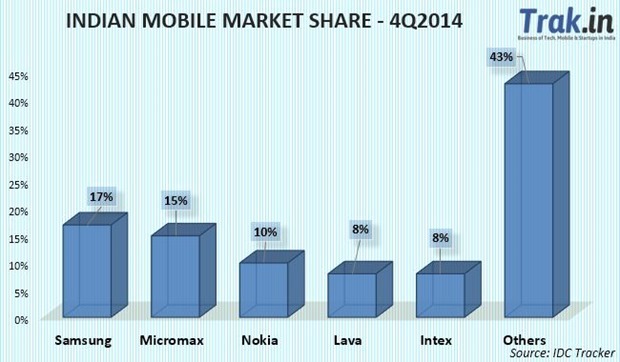 Canalys is not alone, Counterpoint research had declared last year itself that Micromax had beaten Samsung. However, IDC phone tracker contradicts that. According to them, Samsung still leads Micromax in smartphone market share –They still lead by about 3 percentage points. Samsung had a 22% smartphone market share in India compared to 18 percent of Micromax. 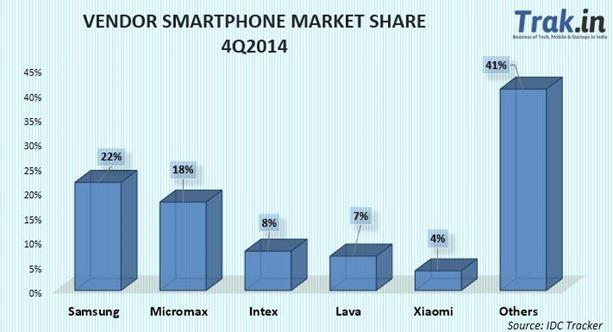 Intex (8%), Lava (7%) and new entrant Xiaomi (4%) are the top 5 smartphone players in India as of 4Q2014. According to Thakkar the demand for high specifications at low price points is going to drive the Indian smartphone market going forward. Xiaomi’s debut at number 5 is testament to the fact that, value for money phones is what Indians are currently looking at. If the numbers from IDC are to be believed, Samsung is still ruling the market. However, they may not be able to hold their reign for too long, especially in 2015 because Xiaomi, Micromax and others are coming up with some really low priced phones with high end specifications and Indians seem to love that!